Download and read the NAADAC Approved Education Provider Guidelines before submitting an application. (2) You are an individual or organization and are applying for approval of a new co-sponsor relationship for either a single event or unlimited trainings for two years. (2) You are an individual or organization and are applying for approval of a co-sponsor relationship that was previously approved for either unlimited co-sponsored training for two years or a single co-sponsored event. Use the NAADAC Approved Academic Institution Education Provider Application, Checklist, and Forms below if you are applying on behalf of an academic institution (college or university) that has not been previously approved as a NAADAC Approved Education Provider. Use the NAADAC Approved Academic Institution Education Provider Application, Checklist, and Forms below if you are applying on behalf of an academic institution (college or university) that has been previously approved as a NAADAC Approved Education Provider. (2) You and a currently approved co-sponsor would like to apply to add to your training portfolio. 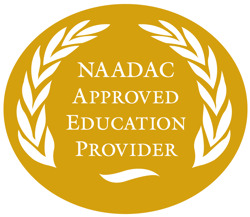 Are you a NAADAC Approved Education Provider? Read & sign the NAADAC Approved Education Provider Logo Use Guidelines & Agreement and submit it to providers@naadac.org to receive a high resolution NAADAC Approved Education Provider logo for use on your professional advertising and informational materials, including business cards, letterhead, website, brochures, email advertising, and other marketing materials.